I'm a singer/songwriter, guitarist. I've been playing guitar with Michael McDonald since 1988. I've also written several songs with Michael that appear on his albums including, "No Love To Be Found", which is a regular song in his live show. Bernie Chiaravalle hails from Marin County, CA, just north of San Francisco. At age 9 he first started piano lessons but his life changed drastically after watching The Beatles on The Ed Sullivan Show. He begged his parents for a guitar (which they bought him) and he hasn't put it down since! Before long he was learning Beatle songs as well as music by CSN, Buffalo Springfield and The Byrds. His parents had also bought him a Philco guitar that came with a record player that he could plug into and play along with records. It wasn't long before he started writing his own songs and started his first band, Logos, along with drummer Mitch Hinard and guitarist Dennis Spadini. Soon they were joined by guitarist/bassist John Lovrien with whom Bernie struck up a songwriting partnership that lasted the better part of 15 years. Other members of Logos through the years included Dave Obedio, Michael Byrnes, Greg Elmore, Ross Bell and Danny Bertoldi. When Logos disbanded in the early 1980s, John and Bernie joined forces with bassist Flavia Paulsen and drummer Mike Morris to form Page One. In 1984 the band made the big move to Los Angeles, in pursuit of the big record deal. It wasn’t to be, and the band broke up in 1987. One great thing about the move to LA was when Bernie got the gig playing guitar for Michael McDonald (formally of The Doobie Brothers) and continues to play for him to this day. Michael and Bernie struck up a writing relationship and have written over 2 dozen songs together, which have appeared on Michael’s records. Bernie also co-produced McDonald’s Blue Obsession album. Bernie has released 7 solo albums. His latest, "ONE BRIGHT MOMENT" showcases 11 new songs written mostly by himself. He also plays and sings all the instruments and vocals. 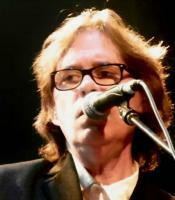 He co-wrote the title track with his longtime friend and bandmate Michael McDonald.